I learned of Thich Nhat Hanh in the late 80’s. I read Being Peace and gave one of his other books to my sister as a gift. I was impressed by the simplicity, beauty and directness of his message. In Sept 1990, I finished my PhD, then flew to Korea for an 8-week pilgrimage to Buddhist temples with my then Zen Master, Samu Sunim. I remember that I had to pass a final format check before I left for Korea. At this time, my whole life revolved around getting my doctorate finished and there was a lot of energy and anxiety focused on passing this format check. Of particular concern was the legibility of one of my figures, which showed the amino acid sequence of the subject of my research, threonine dehydrogenase. Well, I passed the format check and rushed to the Zen Buddhist Temple at 1214 Packard, Ann Arbor, where I was living. I had a couple hours to shave my head and pack. I remember my dharma friend, Asvabhava, kindly offering to shave my head for me. I accepted. It was a big deal, I was realizing, to shave my head and fly off to Korea… I was nervous! Where is the place to do it? I have reflected on these questions, on and off, ever since. 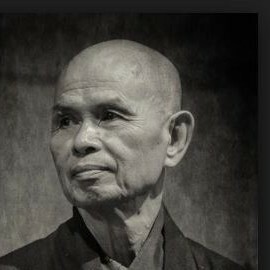 Thank you, Thich Nhat Hanh. A deep bow to you: dharma teachers and friends-in-the-dharma. May they be utterly at peace. Another brilliant mind stopper is, “nowhere to go, nothing to do.” Those words are a healing balm, as well! Yes, I agree. “Nowhere to go, nothing to do” points to the non-seeking mind that finds fulfillment in the hear & now. Thanks! I remember meeting a spiritual healer and I had asked him where I can find peace and happiness. He said Peace and happiness are nowhere. I felt disappointed, but then he wrote this on my hand: not nowhere but now-here. Great story. Thank you, Steven.